We're there when you need us! 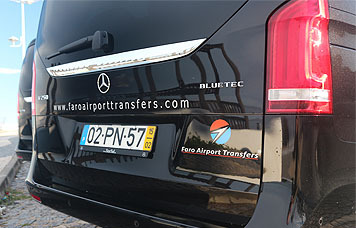 Faro Airport Transfers® provides cheap direct door-to-door private transfer services. No queues before departing, no time wasted on the way! 4.9 of 5 based on 2.137 ratings. 4.9 of 5 based on 1637 ratings. Premium Vehicle; Premium Service! 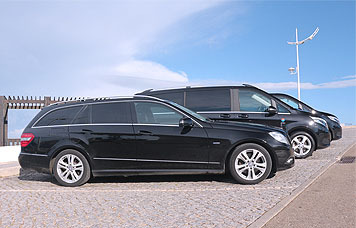 The recommended Faro airport transfers: An "all inclusive" luxury/executive transfer service for groups up to 4 passengers. Treat yourself! 4.8 of 5 based on 1.236 ratings. 4.8 of 5 based on 1236 ratings. Premium Vehicle; Premium Service! The recommended Faro airport transfers: An "all inclusive" luxury/executive transfer service for groups up to 7 passengers. Treat yourself! 4.9 of 5 based on 1.419 ratings. 4.9 of 5 based on 1019 ratings. maximum comfort, safety and punctuality guarantee! When you choose Faro Airport Transfers® for your transportation arrangements, you can expect the best value for money for the services rendered. 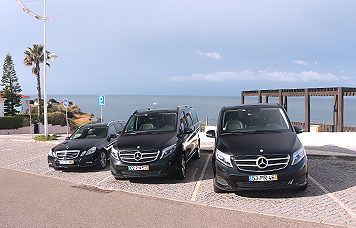 Faro Airport Transfers® operate the most modern air conditioned fleet. All vehicles are fully insured, licensed, meticulously maintained and cleaned. We are a fully registered transportation company and all of our drivers are entirely licensed and qualified to perform their duties to the highest standards. Faro Airport Transfers® Help Desk staff take pride in successfully providing our customers with the highest level of service whenever you need us. Our economy prices are ultra-competitive! Faro Airport Transfers® offers competitive prices for quality airport transfers and chauffeuring services. Our Transfer services are provided by professional drivers, in our fleet of modern and well maintained vehicles. We will make your journey an enjoyable and stress free experience! Your own transfer where you depart from Faro airport as soon as you're ready and go straight to your destination, meaning that you don’t have to waste valuable holiday time waiting for other people or visiting other properties on route. A range of vehicle sizes to suit your needs. Free baby seats or booster seats. Fixed price policy: Avoid surprises - No Hidden Fees! Our vehicles are equipped with a GPS system that is monitored by the office via our computerized tracking system to guarantee punctuality, dutiful driving and safety. Use our online transfer quote calculator to get the best price for Faro Airport Transfers and book your taxi transfer service online comfortably. Whether you need to get from Faro airport to hotel, hotel to Faro airport, hotel to another hotel, transfers to the Algarve golf courses or to the amusement parks, we can help with any transfers you need. Faro Airport Transfers operate the most modern air conditioned fleet of saloon cars, MPVs, people carriers, vans, minibuses and buses with highly qualified staff, so we can guarantee maximum comfort, safety and punctuality in each and every service. Maintained to very high standards. Driven by highly trained, experienced uniformed drivers. Fitted with road speed limiters to ensure your safety. Fitted with GPS tracking system to guarantee punctuality. Fully insured including Public Liability Insurance. We operate a strict non smoking policy in all our vehicles. Multilingual drivers, including English speakers. 24 hour English speaking support number. With our fleet of brand new executive and standard vehicles we are able to provide the most complete transfer service on the market today. Faro Airport Transfers® was the very first company in the Algarve to offer online bookings and quotations for Faro Airport Transfers to the Algarve, other regions in Portugal and southern Spain and have been operating successfully for many years. We are a friendly and reliable Faro airport transfers company which you can trust. Faro Airport Transfers® is a fully registered, licensed and insured Travel Agency and passenger transport company. We are ready to assist you 24 hours a day, 7 days a week on our Customer Service help desk support and you will be given a 24 hour English speaking emergency contact number on you transfer voucher. Faro Airport Transfers will be at your service from the moment of your arrival, during your stay and until your departure! See you in the Algarve!